As the demands for voice, video and data networks are increasing dramatically, more bandwidth and higher transmission speed over long distances are needed. To meet these demands, it means that service providers should depend on more fibre optics which definitely cause more costs for optical devices. But they apply Wavelength Division Multiplexing (WDM) technologies which is a cost-effective way to increase capacity on the existing fibre infrastructure. WDM technology multiplexes multiple optical signals onto a single fibre by using different wavelengths, or colors, of light. WDM can expand the network capacity using existing fibre infrastructure in an economical way. It includes CWDM (Coarse Wavelength Division Multiplexing) and DWDM (Dense Wavelength Division Multiplexing). CWDM is a technology multiplexing 16 channels onto one single fibre between the wavelengths from 1270 nm to 1610 nm. It’s designed for city and access network. 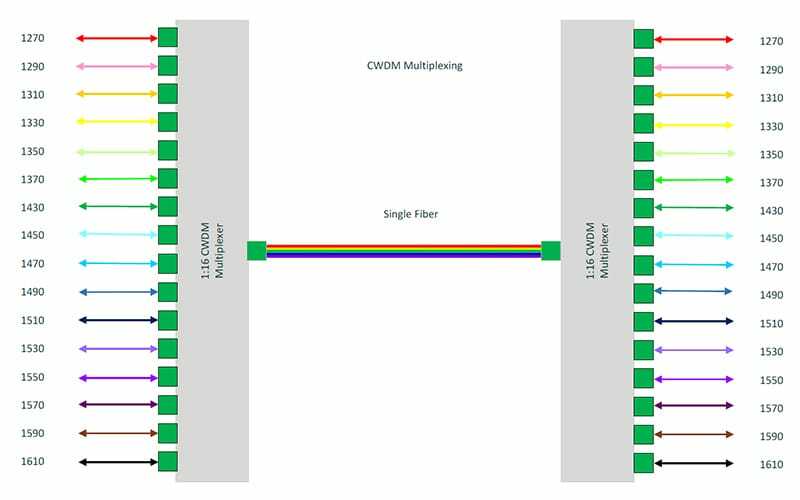 Since the channel spacing is 20 nm, CWDM is a more cost-effective method to maximize existing fibre by decreasing the channel spacing between wavelengths. CWDM is a passive technology, therefore, CWDM equipment needs no electrical power. CWDM technology has been applied into wide areas, such as CWDM optical transceivers, CWDM OADM and CWDM Mux/DeMux. CWDM Mux/DeMux modules are multiplexers and demultiplexers which provide long distance coverage with premium optical technology to enhance fibre optic systems. It multiplexes signals of different wavelengths on one single fibre and demultiplexes wavelengths to individual fibres. CWDM Mux/DeMux can offer low-cost bandwidth and upgrade the existing system without leading spare costs on more fibres. CWDM Mux/DeMux can hold up to 18 channels of different standards (for example, Fibre Channel, Gigabit Ethernet) and data rates over one fibre optic link without interruption. FS.COM offers a full series of CWDM Mux/DeMux, including 2, 4, 8, 9, 12, 16, 18 channels with or without monitor port and expansion port in 1RU 19” rack chassis or pigtailed ABS module. The following will show you how to use a 18-channel CWDM Mux/DeMux to increase the data rates up to 180 Gbps on a fibre pair. 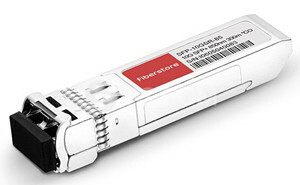 In Figure2, all Cisco compatible 10G CWDM SFP+ 1270-1610 nm 40km DOM transceivers on the switch are connected with the CWDM Mux/DeMux by LC-LC fibre patch cords. This CWDM Mux/DeMux has 18 channels and is designed as 1 RU rack mount size, covering the wavelengths from 1270 nm to 1610 nm and supporting LC UPC port. During the long distance transmission, only one single-mode armored LC fibre patch cord is needed to achieve 180 Gbps by connecting the two 18-channel CWDM Mux/DeMux. Thus, it greatly saves the cost for increasing the bandwidth on the existing fibre infrastructure. To increase the capacity, it requires more space and cable management is also a big trouble. So FS independently researched and developed FMU CWDM Mux/DeMux to solve this problem. We provide FMU 16-ch 1U Rack CWDM MUX/DEMUX specially designed as 2-slot plug and play style, which allows you to add or remove fibre optic cables and plug-in-modules freely according to your applications. There are two separate CWDM plug-in modules. One is high band (1470nm-1610nm) module with an expansion port and the other is low band (1270nm-1450nm, skip 1390nm, 1410nm) module without expansion port. Via this expansion port, channels can be expanded over one pair of fibre without interruption. You can also insert two CWDM Mux/DeMux FMU-plug-in modules without expansion port for two separated 8-channel connections. Besides, you can mix CWDM and DWDM system by adding CWDM Mux/DeMux FMU-plug-in modules and DWDM Mux/DeMux FMU-plug-in modules with matching wavelengths. The table below lists both single fibre and dual fibre FMU plu-in modules for 2-slot CWDM Mux/DeMux. You can choose suitable modules according to you specific requirements. Custom service is available, too. If you would like to increase your network bandwidth while spend less money on changing existing infrastructure, CWDM Mux/DeMux is an economical solution. FS.COM brings you high quality CWDM Mux/DeMux module and newly self-developed FMU 2-slot CWDM Mux/DeMux modules & FMU plug-in modules. For detailed information, please visit our site www.fs.com or contact us through sales@fs.com. This entry was posted in WDM System and tagged CWDM, CWDM MUX/DEMUX, DWDM, WDM on December 7, 2016 by laura.